I came upon this baby chick taking what looked like it's first steps with trembling legs. It was crossing a gravel road! I could hear the frantic loud calls of two Northern Bobwhites very near so I assume this is a Northern Bobwhite baby chick. I am hopeful that the family was reunited. This entry was posted on Monday, May 4th, 2015 at 1:48 am. 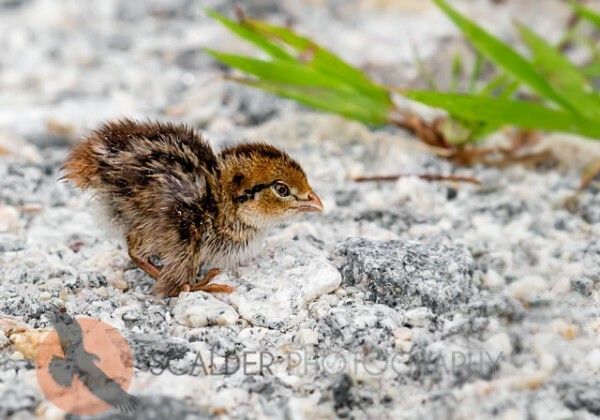 It is filed under Animals / Wildlife, New Images and tagged with baby bird, bird photography, Northern Bobwhite chick, scalderphotography. You can follow any responses to this entry through the RSS 2.0 feed.